Only asking, like, for debate, like. 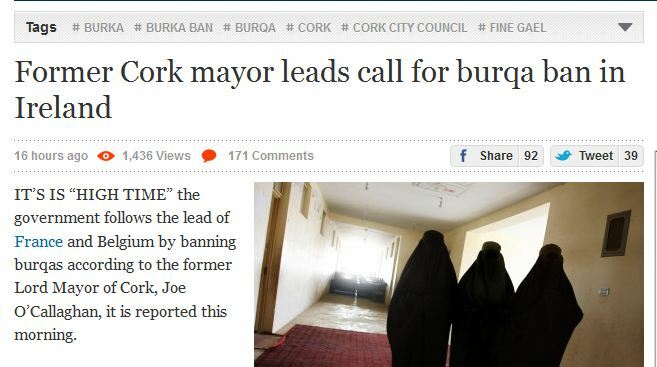 Simply by making the call himself, the councillor was now leading a more generalised call, as though this were a civil society movement of some description, like the call to end slavery, or the call for mortgage forgiveness, and not simply the knee-jerk reaction of people here and there when confronted with burqa scare stories. There are lots of things to be said about this, but I would like to focus on just one: the wording of the second option in the poll: ‘I oppose a ban: women should be allowed to wear the burqa’. This option smuggles in a rather troublesome premise: that regardless of the decision taken to ban it or not, the state has the legitimate power to ban it. Not only that, but it is the state that authorises the woman to wear the burqa -and by extension, everything else- in the first place. So beneath the veneer of ‘let’s-have-the-debate!’ liberalish there is a wholly uncritical and automatic acceptance of the invincible legitimacy of state power. Fintan had a piece in the Irish Times years ago, behind a paywall now, about religious symbols in public life. It was about turbans being banned in the Gardai but a crucifix not. His ultimate point was that either everything is banned or nothing gets banned. I get to thinking that this point counts here to maybe.Can’t imagine this outburst has legs. Fine Gael, like the Conservatives in Britain, may be wanting to limit their exposure to the conservative right wing reactionary impulses like this that you get. I mean, it’s fine if they’re trying to deport people unfit for deporting and the institutional racism and brutally continues. It may depend on what the civil servants feel. Or rather, civil masters.